Spider Silk: Evolution and 400 Million Years of Spinning, Waiting, Snagging, and Mating is an interesting, well-researched book about the history and development of spiders. The chapters progress through the early spiders and cover the astonishing breadth of diversity inherent to the modern-day spiders. Brunetta and Craig describe the differences between the major spider classifications and trace the development of varying silk types with the evolving spiders. Beginning with the more primitive Mesotheles, Brunetta and Craig describe the evolutionary traits that have enabled this diverse animal to be so successful. With spiders’ progressive ability to spin more complex and specific silks, spider species began to inhabit new environments and locations. Brunetta and Craig discuss the reasons for the development of these varied silks, both from a molecular basis and from a behavioral standpoint. 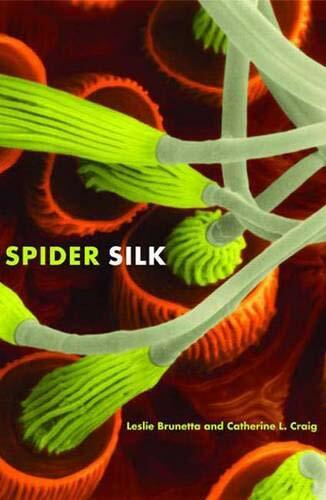 Spider Silk has an excellent chapter on the production of protein from DNA, and what happens when mutational and evolutionary forces occur. The section on how genes evolve from a direct ancestral species, placed in the context of several silk proteins, is particularly helpful and articulate. By examining the predation techniques of such spiders as the jumping spider, the gladiator spider, and the orb weaver spider (which is responsible for spinning the vertical, target-shaped webs we typically think of as a “spider-web”), Brunetta and Craig trace the amazing diversity of web types—not all spiders spin webs—web locations, and web strategies. Together, the huge array of spiders, which first arose 400 million years ago, typifies a successful evolutionary strategy, and the vast spider speciation has allowed this animal to live in highly specific habitats worldwide. The reader will at times grimace at satisfyingly creepy-crawly details, and at other times will be staggered by the illuminating style of Brunetta and Craig’s writing and knowledge.